I wanted it to look like a ruin that no regent would like.… It’s absolutey unfinished, uncouth, and brilliantly strong.… The Ark, for instance, is a ripe building; it has been lived in; it’s been used; it’s been beaten up.… It’s arrived. Our building will take twenty years to arrive. This text was based on my interviews with Vernon DeMars, Joe Esherick, Donald Olsen, Clark Kerr, and others associated with the creation of the building for the College of Environmental Design. This history was written in 1984 when the twenty years Wurster had given the building to arrive had passed, leaving it lived in, used, and beaten up. Somewhat later it was found seismically unsafe, a verdict that was not the fault of the architects or builders who had complied with the codes, but because changing standards had made the codes themselves inadequate. The seismic retrofit that followed took three years and altered the interior, mainly by increasing the shear walls on the ground floor and enabling a welcome remodeling of the library. So the building had a second coming. But my task here is not to assess its re-arrival. The intention of this article is the same now as it was originally: to answer the basic questions about the origins of the college and how it was named and to describe the programming and the design process of the building. These issues were important because this was not just another college on the UC Berkeley campus; it was the world’s first educational institution to be dedicated to the study of environmental design. The motivation for the college evolved during the 1930s and the early 1940s. This tumultuous period brought together professionals in the design and planning fields in unaccustomed ways to consider strategies, which had previously appeared to have no future, for a future with an apparently limitless horizon. One example of this kind of collaboration was the Farm Security Administration, a Depression-born federal agency with a regional office in San Francisco where young architects, landscape architects, and planners designed new communities for California’s migrant farm workers. Vernon DeMars was among the architects; he later participated in the design of Wurster Hall. Figure 1 Enlarge [+]Telesis “Space for Living” exhibit at the San Francisco Museum of Art, 1940, Telesis Reference File, EDA, Berkeley. As the organization expanded to include lawyers, artists, photographers, civic leaders, and other concerned citizens, it inspired a similar organization in Los Angeles with the same name. Through the fourteen years of the formal existence of Telesis the membership actively applied its philosophy to planning and development issues confronting the metropolitan area around the San Francisco Bay. Following World War II, the group’s members were absorbed into the mainstream of professional practice. Some of them joined University of California faculties. If the concept of environmental design took shape collectively over a period of time, the idea of a college dedicated to the concept came, mainly, from William Wurster. By his own account, he had it in mind before coming to Berkeley as Dean of the School of Architecture in 1950. The idea of having one administrative entity for professional fields devoted to the physical environment made good sense to Wurster. His professional and personal life had been laced with close associations with landscape architects and city planners as well as members of his own profession of architecture. Although Wurster had not been active in Telesis, he took what its members did seriously. He also began to take seriously Catherine Bauer, a nationally known housing expert, who was a visiting lecturer in the UC Berkeley School of Social Welfare. In 1940 they were married and later went to Cambridge, Massachusetts, where Bill spent 1942–1943 as a fellow of the Massachusetts Institute of Technology’s School of Architecture. While there he persuaded the members of the architecture faculty and the institute’s administration to recognize the School’s city planning division as a full-fledged, co-equal department. The new entity was named the School of Architecture and Planning. Meanwhile, back in Berkeley, studies focused on establishing a department of city planning in the 1930s and 1940s finally bore fruit in the postwar decade. Established in 1948 with T. J. Kent, Jr. as chairman, the department was housed in one of the campus … temporary wartime buildings. A year later, when Warren Perry resigned as Dean of the School of Architecture, Wurster succeeded him. Kent and Wurster were good friends and shared an interest in the interrelationship of their respective fields. Their collaboration was crucial to the founding of the College of Environmental Design. Each of these departments (City and Regional Planning, Landscape Architecture, and Architecture) developed independently (on the Berkeley campus.) But all three of them, with their many distinguished graduates now scattered all over the world, have played important roles in one of the great revolutions of our time: the effort to integrate practical needs with science, technology, and art in the design and organization of the man-made environment, an international movement to which California has made important contributions in all three realms.… As the responsibilities in each professional field have broadened and deepened, the need for mutual contact and understanding has become more apparent. Although the concept of the college implied an interdisciplinary structure, the intention was not to train an all-purpose professional who would address the movement as a whole. Rather the task was to strengthen the departments and the liaisons between them through joint appointments and interdisciplinary courses. The students would then have the opportunity to mix and match studies in their chosen areas while being part of the whole picture in the natural way that physical proximity implied. 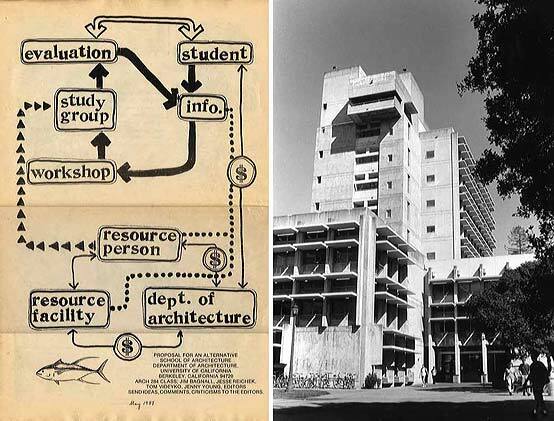 Figure 2 Enlarge [+]Left: Early Schema for Wurster Hall, 1959, Donald Olsen Collection (2003-1), EDA, Berkeley; Right: “Architecture College Grows Fast” from the UC Berkeley student newspaper The Daily Californian, May 10, 1957. Some members of this informal group also belonged to the City and Regional Planning department’s Faculty Group, which was responsible for governing the department during its formative years. Soon after assuming his academic duties in Berkeley, Wurster wrote to President Gordon Sproul suggesting that the departments of Architecture, City and Regional Planning, and Landscape Architecture be linked together. Sproul responded by writing to Jack Kent, “… wondering if we really wanted to do this thing since everything was going so well.” Kent then suggested forming a committee composed of members of the three departments and called by the acronym ACPLA. The committee met regularly for four years, and although there was considerable interest in grouping the departments in a new college, no one took responsibility for formulating a definite proposal. When Kent returned from his first sabbatical in 1955 and found the issue of the college unchanged, he assembled background reports from the different departments and created a proposal. He also drafted legislation for the departments and the academic senate to consider. During his chairmanship of the ACPLA in 1956–57, the committee produced a proposal to establish a College of Environmental Design, which was submitted to the chancellor’s review committee in April 1957. The proposal had reports from the three departments that covered the histories of the fields and the work of the university in them and evaluated the advantages and disadvantages of the proposed college. Architecture was the only department that noted no disadvantage serious enough to mention in the report. It was not only the oldest department, having been in existence since 1906 and designated a college in 1957, but also had by far the largest number of students and faculty. During his deanship Wurster had joined the undergraduate program to the graduate School of Architecture to create a college. To combine the departments of City and Regional Planning and Landscape Architecture with Architecture in some mutually acceptable manner was a reasonable strategy for gaining university recognition for the design professions as a whole. Still, the other departments were wary of having their own distinctive fields subordinated to the older and larger field of architecture. All three departments had ties to other disciplines in the university. Landscape Architecture, housed in Agriculture, was also related to Forestry and Conservation. City Planning had two main branches, physical planning and public administration. The social science fields were also related. Since the academic backgrounds of more than half of the eight faculty members were unrelated to design fields, some of them were concerned that their joining the design fields would be taken as a move away from their fields of interest. In fact, Jack Kent had proposed the name for the college because the term, “environmental design” had often been used by the Telesis group and was considered appropriate by its former members. However, it had no historically accrued values for the majority. Within the College of Architecture, the term provoked hoots and snickers. It sparked such indignation among professionals in the outside world that Wurster felt constrained to set up what he called a “professional committee” to meet with him and the faculty about matters of mutual concern. When it turned out that what the committee considered to be of mutual concern was mainly the organization of the new college, Wurster disbanded the committee. Even so, at a confrontational meeting at the Clarement Hotel in Berkeley, members of the profession voiced their disapproval of the name along with other aspects of the proposed college. In the beginning, Wurster and his wife, Catherine, had not favored the name because they thought it was pretentious. But when the uproar failed to produce another name, “environmental design” stood by default. This hurdle out of the way, the legislation worked its way through the various committees in 1956–57 and was approved by the Academic Senate in 1959. The issue of the name surfaced for the last time with proposals for the new building. A faculty memo from Wurster dated October 12, 1961 was headed, “Name, if any, for the Environment Design Building.” In it, Wurster discussed the names of two possibilities, John Galen Howard and Bernard Maybeck — both architects — had been suggested to him. No names relating to the other disciplines were mentioned. The memo closed with the statement, “This action should never be a hasty one, and it is proposed to let the matter go as it is with no man’s name, but these words might start the discussion.” In hindsight, Wurster’s failure to muster another name for the new building seems prophetic since when he retired, in 1963, the building was named for himself and Catherine. 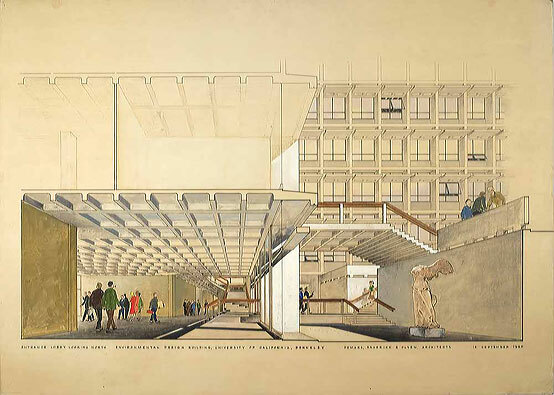 Figure 3 Enlarge [+]Left: Early Massing Drawing of Wurster Hall, Joseph Esherick/EHDD Collection (1974-1), EDA, Berkeley; Right: Proposed Layout of Wurster Hall, CED Records, EDA, Berkeley. To design an educational environment for professions whose work was designing the physical environment was not a typical architectural challenge. Wurster approached it with a zeal that came from not only from the opportunity at hand, but also from the memory of a project that he had orchestrated at MIT during his deanship there. Lawrence Anderson and Vernon DeMars, a visiting professor, directed a student research project that led to a faculty housing project sponsored by the New England Life Insurance Company. When the university and the company asked Wurster to advise them on the selection of architects for the project, he told them that he had hired the brightest and most capable architects for his faculty at MIT. As a result, Vernon DeMars, Robert Kennedy, Carl Koch, Ralph Rapson, and William Brown, Jr. were hired to design the building, a twelve-story apartment building for MIT faculty, now known as 100 Memorial Drive. Wurster then left his brightest and best alone to create the design. However, as DeMars recalled, since no one was put in charge, no one took the lead for fear of being judged a prima donna. After some thundering on Wurster’s part the team got to work, but consensus came slowly. Finally, Rapson was delegated to draw up the final scheme. The result was a widely published building design that won several awards. The halting beginnings were forgotten, and Wurster was convinced that a team of un-like-minded architects could produce a brilliant design. In the late 1950s, when the question of selecting architects for the new college building on the Berkeley campus arose, DeMars had become chairman of the architecture faculty and had opened an office with Donald Reay in Berkeley. They had joined Donald Hardison in a competition for the new student union complex, which they won. DeMars was Wurster’s first choice for the team of architects being assembled to design the College of Environmental Design. Two other strong candidates on the faculty were Donald Olsen and Joseph Esherick. From Wurster’s point of view the important thing was that the three candidates had totally different points of view. A distrust of unanimity led him to constantly stress variety in the faculty. He said he wanted, “strong people, each with a different slant.… The school should present a rough place with many cracks.” DeMars conjectured that he and Esherick were chosen for their different degrees of humanistic leanings while Olsen represented a formalist perspective that would correct any overly romantic tendencies. According to Clark Kerr, UC Berkeley’s first chancellor who became president of the entire university in 1958, the administration was reluctant to approve the appointment of three faculty members for the design of this major building. Design by committee had inherent difficulties in achieving consensus. These difficulties might be compounded because the architects would not have the useful immunity to inside pressures that outsiders enjoyed. But Wurster countered, successfully, that not hiring the faculty team would be a vote of no confidence in the level of skills in the department at the very moment when they could be used most appropriately. Besides, this was a unique opportunity. 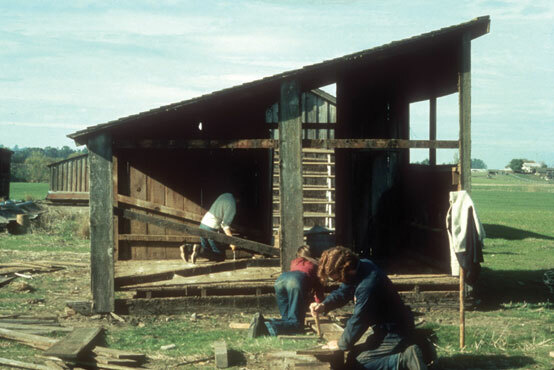 Figure 4 Wood Structure with lean-to roof, Inverness, CA, 1972, Courtesy of Sim Van der Ryn. Kerr appointed a faculty building committee to advise the architects on departmental needs. Members of the committee were: Francis Violich from City and Regional Planning, George Simonds from Architecture, H. L. Vaughan and Robert Tetlow from Landscape Architecture, Lucretia Nelson from Decorative Arts, and Helen Worden, who represented the university library system. Louis Demonte, the campus architect, served as the liaison between the faculty committee, the team of architects, and Elmo Morgan, the university vice president who was the official client for the building. Serving as both an administrator and an architect, DeMonte ran what he described as a three-ring circus. The 137,972 square feet allocated for the building was apportioned to the departments according to the needs stated in their programs, which were the result of intense bargaining within the departments and among the faculty representatives. Location issues had to be resolved within the context of decisions about the site of the building and its place in the overall campus planning process. 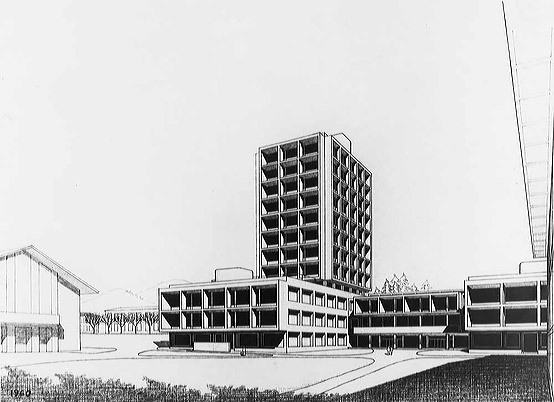 In the 1956 Long Range Development Plan , major new campus developments such as the student center, the art museum, and dormitory complexes were located on the south side of the campus where few large or important buildings were located and more open space existed than on the north side. The consolidation of campus precincts devoted to related disciplines was a priority. Music, art, and anthropology were located in the southeast corner of the campus where a nearby site was under consideration for the art museum. During his participation in the Campus Planning Committee, Wurster had come to believe that the new college would benefit from proximity to the humanistic disciplines of anthropology, art, and music. More importantly, a site large enough for the new building would exist if College Avenue, which ran through the campus, was closed and some miscellaneous structures and tennis courts were removed. By the time the architects were selected, the south site had been determined. To preserve the open space that gave the campus its park-like setting, the Long Range Development Plan also stated that buildings should cover only twenty-five per cent of the land. Since this decision made tall buildings or tower elements inevitable, the skyline and the location of these elements became important issues. A large building that would mark a gateway to the newly important southeast campus precinct was a logical decision. Wurster favored a tower element for the new building. Another important feature that he and others favored was a courtyard. A most cherished feature of the “Ark” (as the old Architecture building was called) was the brick-paved court where social and ceremonial events took place. The new building’s court was meant to express continuity with the old setting, to be the symbolic heart of the new college building. The team of architects and the faculty building committee went to work in the fall of 1958. Those who participated recalled that the two years of bi-weekly meetings resembled the deliberations of the representatives of clans who had agreed to occupy the same turf, but wanted the internal boundaries made clear. The foremost problem was allocating space for the departmental components. The architecture department and the library wanted locations on the north side of the building, the former to have a favorable exposure for the studios, the latter to avoid the damaging effects of sunlight on the books and other printed matter. The landscape architecture representatives also favored the north side, because an adjacent open space could be used for demonstration gardens. This idea was abandoned when the Melvin Calvin Building was sited in the area. The location of the department offices was a critical issue. Although grouping the offices together expressed the spirit of the college, the departments wanted their faculty offices and support spaces located nearby. The different sizes of the departments resulted in a plan which, even though it worked in some ways, was unacceptable to the smaller departments because it had them all be lined up facing the architecture office. Lengthy committee meetings gradually produced a workable plan. The most vocal committee members, Lucretia Nelson from the Decorative Arts department and Helen Worden from the library, won acceptance for their plan. Other plans were never formulated. Issues of department identities came up so often that Esterick suggested that the college issue department T-shirts. 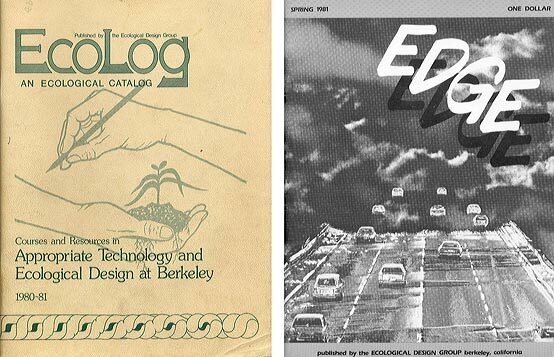 Figure 5 Enlarge [+]Left: Ecolog Catalog, 1980–81, Student Publications CED Records, EDA, Berkeley; Right: Edge , published by the Ecological Design Group, Spring 1981, Student Publications CED Records, EDA, Berkeley. Consensus among the architecture faculty members was also elusive. DeMars recalled that, as with the MIT project, it was not clear to the members of the design team whether one of them should take the initiative in the design process or that they should participate equally. Although Wurster was aware that the three architects had very different perspectives, he did not see this as an impediment to production. “At least,” he affirmed, “they can work at cross-purposes together.” While Wurster did not participate formally in the design deliberations, he was the eminence grise whose wishes were taken seriously. Esherick estimated that the two years of meetings about the building program had produced about twenty schemes. Not all were developed in any detail. However, an early scheme drawn up by Vernon DeMars in September 1959 showed the building as a set of differently scaled and articulated blocks around a generous court. But since this one and others proposed by DeMars exceeded the site boundaries, they were not successful. Figure 6 Enlarge [+]Proposed Design for Wurster Hall, Donald Olsen Collection (2003-1), EDA, Berkeley. Although progress was slow, major pieces of the plan were coming together. The departmental office locations on the second floor were settled. City and Regional Planning and Landscape Architecture were on the north side along with the library. The dean’s office had a central location immediately accessible to the stairway and the entrance to the court. Architecture was next door in the second most obvious location, and Decorative Arts was down the hall to the south. Classrooms and studios were near their department offices except for the Architecture studios, which were stacked up in a tower on the north side to get the proper exposure. The sculpture studios, which had migrated to the new building along with the Decorative Arts department, occupied the south side of the building. The last major space, an auditorium to seat about 200 people, was still not anchored. Wrestling with pieces of the puzzle, Don Olsen had finally made a schematic plan that was acceptable to everyone involved. 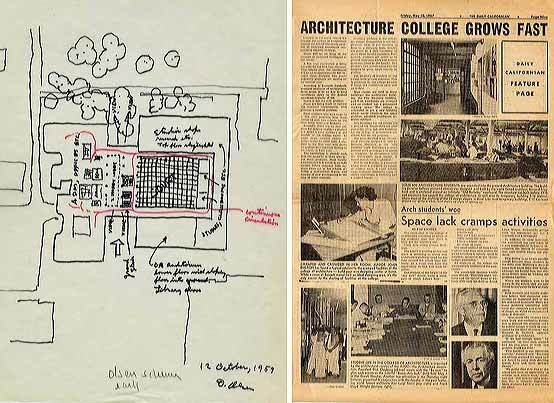 Figure 7 Enlarge [+]Left: Proposal for an Alternative School of Architecture, 1987, CED Records, EDA, Berkeley; Right: Photograph of Wurster Hall, Joseph Esherick/EHDD Collection (1974-1), EDA, Berkeley. With the approval of the final plan in 1960, design development could proceed. Since Donald Hardison had resigned from the team, it was necessary to find another office for the production of the working drawings. Although the university had previously questioned whether small offices could carry out this task, the advantages in terms of continuity and rapid progress, of having the work done in the office of one of the team principals resulted in Esherick’s office being chosen to take charge. Esherick then organized a staff composed of George Homsey as the project manager and Richard Peters, Chester Bowles, D’mitri Vedensky, and Victor Torres. Weekly meetings were held with all the architects, but the design process took place largely under Esherick’s direction. Isadore Thompson, the engineer for the building’s structural system, advised the architects on the use of both pre-cast and poured concrete. The pre-cast used some light-weight aggregate and was used in the sunshades and main exterior walls. Two-story pre-cast sections were lifted in place while the concrete was poured for the floors, the roof, both ends of the tower, and the east end of the south wing. The elevator core and stair towers were poured and became the sheer elements for seismic bracing. Since this was the largest building yet constructed that used pre-cast elements, the achievement of dimensional control above three stories was problematic. Yet this aspect of the structure was successful while steam-curing of the concrete, which was used to save time and reduce the number and expense of the forms, resulted in a crazed surface that had an unattractive appearance when wet. One aspect of the design that has been generally misinterpreted was the exposure of the ductwork and other mechanical equipment. Far from being an expression of style, it was a means of avoiding the tunnel-like corridors that a dropped ceiling concealing the equipment would have produced; it also provided high ceilings in the rooms. Esherick designed parts of the system. “Getting the ductwork neat and orderly was something I did because the mechanical engineers didn’t have any special feeling for it. If the ducts ran down the corridors, we could put the stringy stuff in the rooms. In the studios the main distribution is in the center so you have the feeling of a higher space around the periphery.” Having the mechanical equipment exposed also made maintenance easier and was useful in teaching. Figure 8 Enlarge [+]Wurster Hall Entrance Lobby Perspective, c. 1960, CED Records, EDA, Berkeley. Clark Kerr, then the university president, was shocked by the relentless repetition of concrete forms. Much earlier, during the design development phase, Louis DeMonte recalled teasing Esherick by asking him, apropos of the sunshades, if it took that much concrete to cast a shadow. At first, DeMars also questioned the use of just one material, but later he concluded that the concrete horizontals gave the building a sculptural unity consistent with its character. Esherick’s chief regret was the the university judged the building to be maintenance-free. Weak points such as the caulking were never checked or re-done when necessary. If, as many think, the building did not age gracefully, there is no single cause. It was certainly appreciated for its capacity to withstand neglect and intensive use. While it took a beating, it kept the uncouth character that Wurster so admired; it did not become comfy like the lovable old Ark. As for fashion, the pendulum moved to the opposite side, and nostalgia for the days of rich materials and ornament prevailed. Where beauty has to be sought out and extracted from a reluctant environment, the arts often seem to flourish best; wherever it exists in profusion and variety it is likely to be accepted as a condition of daily existence, a kind of birthright calling for no special acknowledgment. Extracting beauty from the environment is what the College of Environmental Design is about.